T Alerts wrote: Newburyport Line Train 163 (1:20 pm outbound) will be assisted back to Boston where a new train set will take passengers out to Newburyport. Looks like outbound train 111 just used track 2 to run around the dead 163. The inbound 168 was holding at the Wonderland interlocking for 111 to pass, and appears to be now going to be crossing over to track 1 to shove the dead 163 back in. Quite a ballet. T Alerts wrote: Update: Newburyport Train 163 (1:20 pm outbound) will NOW be assisted to Lynn where a new train set will take passengers to Newburyport. 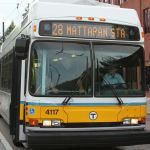 T Alerts wrote: A Shuttle bus will replace Newburyport Train 170 between Newburyport & Beverly. Passengers can take Rockport Train 118 at 3:58pm from Beverly to continue inbound to Boston. Indeed train 168 went by 163 on track 2 as usual, not helping out. Sounds like the set that was going to be 170 is now going deadhead to Lynn. Maybe one of the new leased work units is doing the rescue "assist" of 163 to Lynn and presumably back to the house. That would be an interesting photo op at Lynn in a little while. Very unusual set of moves! Train 163 (previously dead, now presumably being rescued) is back online and heading north. If the speed doesn't get up to the usual 70MPH between Eastern Ave. and the Saugus Draw - which seems to be the case because it's only going 31MPH going by the Wonderland interlocking - then we can assume it's a double-draft with the set that was going to be 170 that came down from Newburyport for the rescue, or it's got a work engine tied on. Once it gets to Lynn if the car ID changes from 1652 to another one that will be interesting to see. T-Alerts wrote: Update: Newburyport Train 163 (1:20 pm outbound) an extra train set is approaching Lynn to assist passengers to Newburyport from Train 163. Weird... the formerly-disabled train 163 is heading all the way up to Newburyport still with the consist with CTC 1652. It was going almost 60MPH between Beverly and North Beverly so somehow it's not a double set after all. Maybe they did the passenger transfer from the dead set to this set at Chelsea instead of Lynn. I wish the MBTA would send location data for all train sets all the time, even when not on a revenue trip, but they don't want to do that for some reason. 122 towed 120 in from Rockport last night. The 2019 had issues. At noon today at the Needham Heights layover yard, an MBTA Geep of some sort (it was too far away for me to ID it) latched onto the cab car end of a 5 car train (all single level) and its F40PH "power" and pulled it out of the south end of the yard (a fairly rare move as most yard access happens at the north end to/from the Needham Heights platform) heading to perhaps the shops? I'm guessing this train failed to launch for the morning rush but I could be wrong. NECN reported this AM that the Haverhill line was delayed due to a slow freight train. I am not impressed. Providence Train 815 (2:30 pm outbound) remains stopped at Sharon due to a mechanical issue & is currently 100-120 min late and will be assisted by Train 817. Updates to follow. Wow, approaching two hours. 817 has been behind it assisting for an hour -- what could be taking so long? Brakes won't release? Providence trains are experiencing delays/cancellations due to disabled trains at Sharon. Train 819 (3:55p) & 821 (4:30p) will accommodate as many passengers from Train 815 (2:30p) & 817 (3:25p) at Sharon as possible. Wow. That gives real confidence you MIGHT get home today! Most trains were operating about 10 minutes delayed out of North Station tonight for the tail end of the evening rush. Around 5:30 today train 422 had an "engine compartment fire" at or near Belmont. The 494 train is going to push the disabled 422 in to Boston. I was already waiting for 494 at Porter, so when the combined set gets here soon I should be able to report the loco number. StefanW wrote: Around 5:30 today train 422 had an "engine compartment fire" at or near Belmont. It was 1055 that had the fire. Here's the combined 422 (dead) and 494 coming in to Porter. I got first-hand reports that it was most likely a failed turbo in the 1055 HEP. Apparently there was a gigantic eruption of fire from the rear exhaust of 1055. Whatever damage was done from the fire and water from the firefighters was serious enough that they couldn't get MU to work between the two sets. We got to North Station just after 7PM... 422 was approximately 1 hour 20 min. late and 494 was about 50 min. late.